‘Valuing the Ocean’ is an initiative of the Calouste Gulbenkian Foundation that aims to enhance the environmental sector's ability to communicate the role of the ocean for human wellbeing, in particular by facilitating a collaboration between the fields of natural science and economics. The Foundation’s London branch has decided to take a laboratory approach with Marine CoLABoration to foster engagement and a shared, co-created vision. Watch the short movie about the first year of Marine CoLAB, edited by Sue Ranger with contributions from the participants. 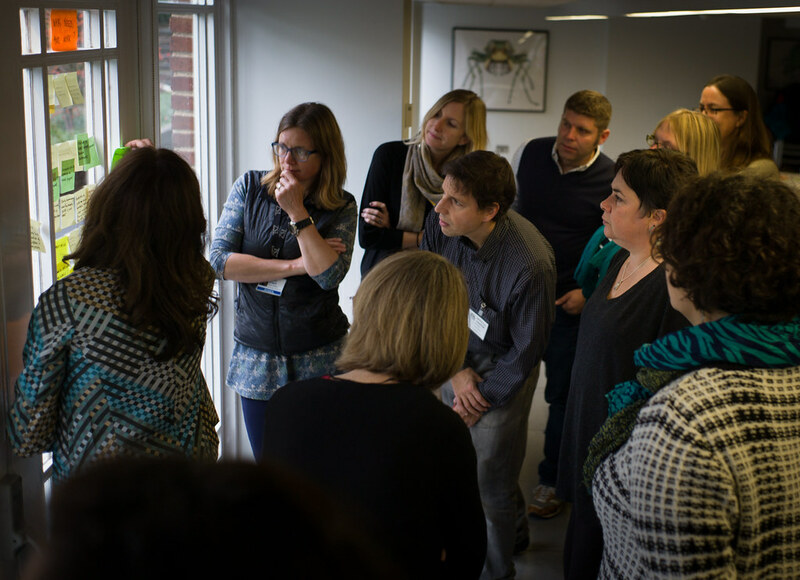 See FoAM's photos from the Marine CoLAB workshops. Read the Lab Approach Essay, in which FoAM describes how we designed, facilitated and documented the lab process during Marine CoLAB's incubation phase. Learn more about the Gulbenkian Oceans Initiative and watch a short video describing the programmes in Portugal and the UK. The Ocean Connects Us was a daylong event at the Trinity Buoy Wharf on the bank of the River Thames. It was a day of participatory experiences, learning and exchange – including the launch of new research from the FrameWorks Institute into how the public thinks about marine conservation – to build on what works, strengthen existing connections, seed new ones and explore possible new approaches in communicating the value of the ocean in people’s lives. 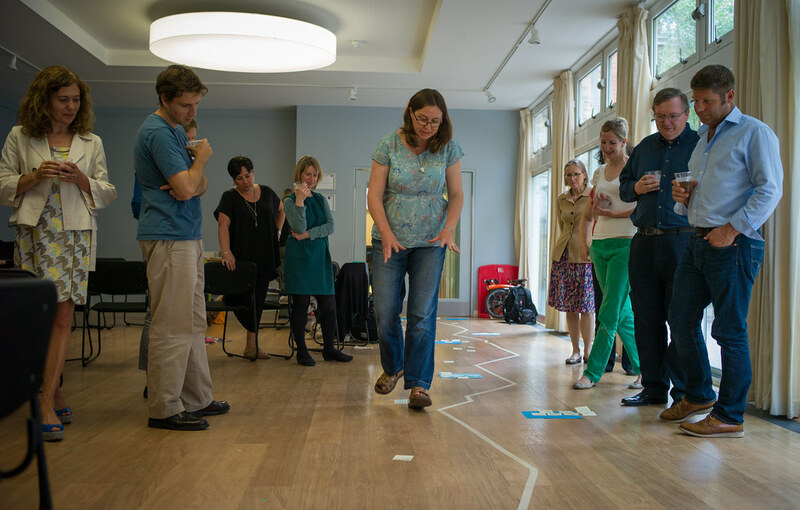 The workshops are designed to provide the space and resources for a small group of organisations to meet regularly over a two-year period to explore existing practices, and identify and experiment with new ones. Marine CoLABoration is particularly interested in looking at how better to bridge the gaps between innovative local practice and influence at national and EU levels, and how to convey the intrinsic as well as socioeconomic value of the seas. We began by we looking at how Marine CoLAB could change the world - from individual, collective and global perspectives, today and in the future. When we looked into the previous world-changing experiences of the participants, we found that the group is keen to seize opportunities to reframe challenges and find ways to refresh whole systems. To be effective change-makers you told us you required appropriate capacities and a youthful, entrepreneurial spirit. Aside from your own qualities, you also need other people. World-changing happens through trusted collaborations and networks, and often with a strong social safety net. In the process of changing the world, you felt excited, inspired, rewarded, free and happy, but also exhausted and often frustrated. We talked about what we know, presume and don’t know about valuing the oceans. It was apparent that there is a lot of knowledge about oceans in the group, but also some confusion about what 'valuing' oceans actually means and how it can contribute to healthier eco-systems. Rooted in the knowledge about the present, we probed what the emerging trends and weak signals might be, and questioned how valuing the oceans might evolve. Climate change and the growth economy emerged as he most important, but also most uncertain drivers of change for Marine CoLABoration. Based on these two drivers, we created four scenarios and asked how Marine CoLAB would change the world in four quite different yet possible futures. What emerged were a few interesting directions, each of which involved changing the world through establishing or strengthening connections. Marine CoLab was creating links between the ocean and society, between governments and corporations, it was bridging the gaps between local and global governance of oceans, and working towards sustainable growth by integrating values with innovation. Even though these answers emerged from speculative scenarios set six to ten years in the future, any of them could become a Marine CoLAB initiative much sooner than that. Whether they will be taken up depends on your interests and experience. In the afternoon the group agreed on the experiments they will develop until the next workshop and settled on Plastic Pollution and Transparency of Marine Industries. Two of the experiments designed in March, Game On! and Gone Fishing in the Thames will continue to be developed but were not discussed further at the workshop. Before the designs were finalised, they were tested using a role playing exercise called a pre-enactment to challenge some of the participants’ assumptions from different points of view. The workshop ended with a design and planning session for the groups to clarify their implementation plans. Follow-up conversations are planned through conference calls, emails and wiki updates, aiming to have the first experimental results to present at the next workshop. The fourth workshop brought to an end the scoping phase of the Marine CoLAB. The experiments were concluded, providing insight and preliminary results that were shared in the group. There were two main purposes for the workshop: to clarify what has been learnt from the experiments and to introduce collbaorative processes to enable these (or similar) experiments to be used as a foundation for larger, longer term projects, using an iterative, experimental approach. The progress and conclusions from three experiments were explored; Transparency of Marine Industries and blue divestment, Plastic pollution from a systems change perspective and Game On!. Two of the experiments were used to introduce techniques for scaling and extrapolation of the preliminary results. As the experiments became more concrete and the more clearly related to existing work, the participants felt it would be easier to commit time and resources to development. The workshop concluded with sessions to evaluate the outcomes of each experiment, the scoping workshops and the wider collaboration. The main purpose of the Lisbon trip was to strengthen the sense of direction and shared values for the Marine CoLAB. There were several opportunities to extend the community by building connections with Portugese marine NGOs. Thursday (23/09) was dedicated to Marine CoLAB which was designed collaboratively on Wednesday (22/09). The first session in the lighthouse of Nazaré introduced the participants to the Portugese marine conservation context. Catarina Grillo welcomed Marine CoLAB and described the context within which the Gulbenkian Oceans initiative GOI operates. During a field trip to Peniche, the participants had a chance to hear and speak to people involved with GOI, namely SPEA (Sociedade Portuguesa para o Estudo das Aves), WWF Portugal and two researchers from the Centre for Environmental and Marine Studies (CESAM) and NOVA School of Business and Economics (NOVA SBE). The trip ended with a visit to the Lisbon Oceanario, with a networking event with Portugese marine NGOs and a visit to the aquarium and their temporary exhibition Florestas Submersas by Takashi Amano. Thursday (25/09) was dedicated to the Marine CoLAB session, held at the CGF headquarters in Lisbon. The morning started with the Marine CoLAB’s project incubator. The most developed Plastics experiment was discussed in detail, with sessions spilling into the afternoon in order to design the funding application to the Oak Foundation. Other initiatives, such as the Transparency of Marine Industries, Value Added Marine Conservation and Game On! were briefly touched upon, and plans were made to continue the discussions in the next Marine CoLAB workshop. Projects by individual participants and their organisations that are related to Marine CoLAB were listed (e.g. Marine Safe, River Academy, Beach watch, Ocean Optimism, Sustainable seafood coalition, etc.). Before the next workshop each participant committed to draft a brief note outlining the project, why it is relevant to Marine CoLAB and what it might need from Marine CoLAB. The afternoon focused on the broader aspects of Marine CoLAB as a platform, a network of networks, melting pot or “Marine Innovation Exchange”, where the participants could inform, support, mentor and inspire each other, where their individual efforts could be amplified and scaled, where they would find time and space to (re)think collaboration. The workshop ended with planning and action points leading into the next session in November 2015 in London. 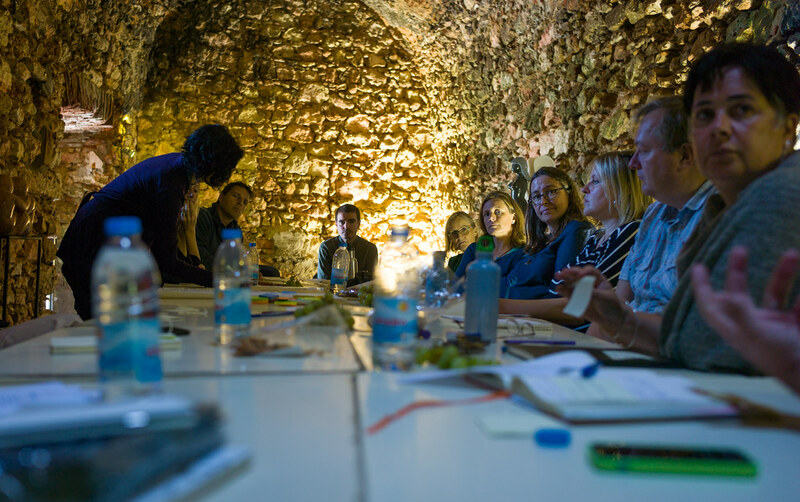 The final workshop of the first year of Marine CoLAB was designed based on the needs of the participants expressed during the CoLAB session Lisbon in September. In the morning the participants focused on the network as a whole, beginning with reflecting on Marine CoLAB so far: what worked and what needs more work. Grounded in the past and present experience of Marine CoLAB, the participants moved into a visioning process lead by Giles Bristow, to clarify the overall Marine CoLAB vision and mission. The stories from Marine CoLAB in 2021 lead to refining the mission of Marine CoLAB as a network with ambitious goals (eg. 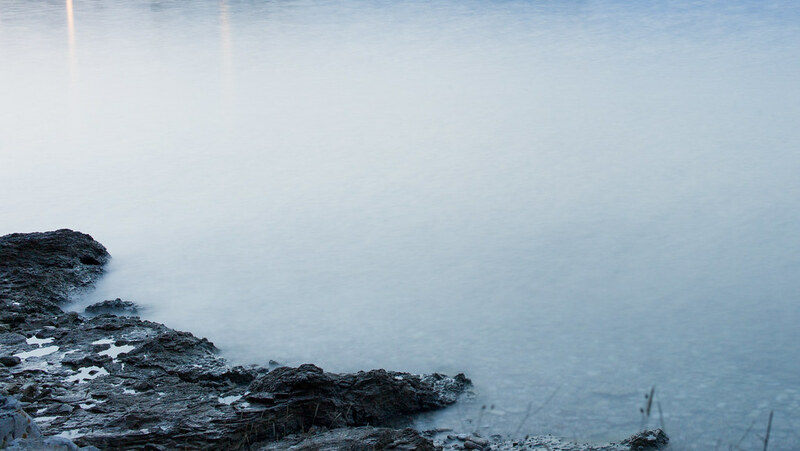 reduction of the impact of fossil fuels on oceans) focusing on amplifying values-based approaches to behavioural change and stronger connectedness between humans and oceans. Sue Ranger took the group through a presentation and discussion of a values based approach, as a lens that can be used to shape and evaluate projects, experiments and the initiative itself. In the afternoon the focus shifted to the Marine CoLAB project incubator. incubator. The first session, facilitated by Aniol Esteban was a broad mapping of existing and emerging projects of the participating organisations which could be relevant to Marine CoLAB. Thirteen projects were discussed and three main focus areas identified: MPAs and marine planning, Capacity building, Education and Communication. The next steps include a more in-depth mapping of interactions and engagement, as well as potentially rethinking the projects using the values lens. Two following sessions discussed the two projects that emerged from previous workshops: GameOn! guided by Sandy Luk and Plastic Bottles project lead by Heather Koldewey GameOn! looked at possible gaming approaches to ocean engagement, specifically at a game-lab process for developing mini games, developing a marine conservation game (possibly using augmented reality) and influencing game developers through a think-tank or 'one-stop-shop' approach. The session ended with an overview of advantages and disadvantages of all three approaches, and concluded that there is more research and experimentation needed, in order to be able to answer whether perception of the value of oceans can be changed through digital media. The working session of the Single Use Plastic Bottle free London project included looking at the values based approach, the collaborative structure, as well as an implementation plan and stakeholder engagement over the short and long terms. During and after the workshop several follow-up meetings have been planned, to be held in December and January. The day ended with a session about the future of Marine CoLAB in 2016. The participants agreed that the focus for 2016 should be on designing and experimenting with Marine CoLAB as a collaborative network, as well as on communication and stakeholder engagement (including stronger organisational buy-in). This could happen in 4-6 day-long sessions with the entire group. The first workshop for 2016 is currently being planned for late January or early February 2016. The result of the Marine CoLAB meetings in the first part of 2016 would be an ambitious mission, supported by a clear values-based strategy, implemented through sustainable business and governance models. Marine CoLAB projects will continue to be developed in smaller working groups. The Single Use Plastic Bottles is the first funded Marine CoLAB project with its kick-off in January 2016. GameOn! might continue depending on the outcomes of the initial research, and more projects are likely to be identified and developed through the mapping of the Marine CoLAB Incubator. The participants noted that there must be sufficient time and space for open thinking and exploration outside of specific projects, to ensure that the value of the Marine CoLAB approach is understood and appreciated by their organisations and other stakeholders. To this end, each of the participants will put together a written reflection of the first year of Marine CoLAB, explaining how it affected their ways of working and its potential long term value for oceans. Notes can be found at workshop 20151125. Notes can be found at workshop 20160121. On the 21st of January FoAM and CGF conducted a reflection meeting to discuss the progress and investigate possible evaluation frameworks. The goal for this workshop was to set out the activities and outcomes for 2016 and continue discussing how to organise beyond 2016, in order to continue collaboration and effectively communicate the Value of the Oceans and Marine CoLab issues. The group provided updates on the current Marine CoLAB projects and a new 'consulting' hour has been established to support individuals with their Marine CoLAB-related projects. The workshop aims to finalise the vision, mission and objectives, as well as the timeline and the workplan for 2016, discuss the governance structure and identify activities in 2016 and beyond. The day begins with an update from current Marine CoLAB projects and ends with the group consulting on the Chagos and Game on! projects.